The Griffin RTA by Geek Vape is the newest RTA out right now. This RTA features a large build deck with Velocity Style (2mm) Posts that is compatible with Clapton coils. 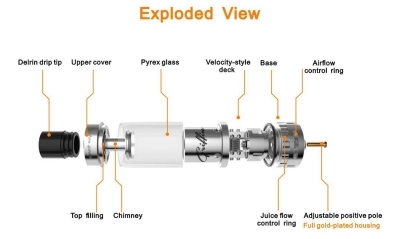 Geek Vape Griffin RTA Tank. Griffin is compatible with any 13.5mm drip tip. You can also use your own drip tip with 510 connector. It comes with 510 thread. Sub-Ohm: Sub Ohm vaping is inherently dangerous and injury can occur if certain safety guidelines are not always followed. You must be also ensuring that your batteries can handle sub ohm atomizers and coils. If you're using a regulated mod, make sure it can handle the amps.